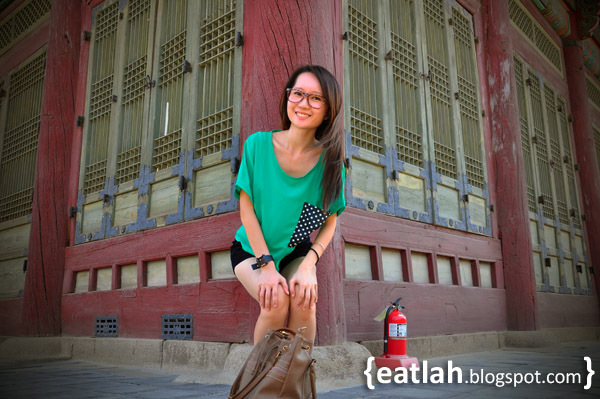 Gyeongbokgung Palace - Seoul Attractions & Things To Do | where and what to eat lah? 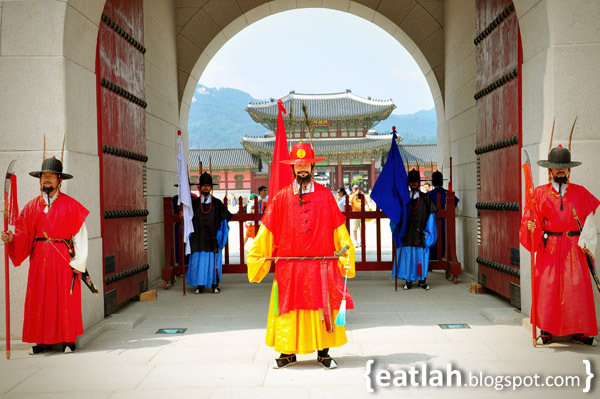 Gyeongbokgung (경복궁), also known as Gyeongbok Palace, is a royal palace located in central district (Jongno-gu) of Seoul. 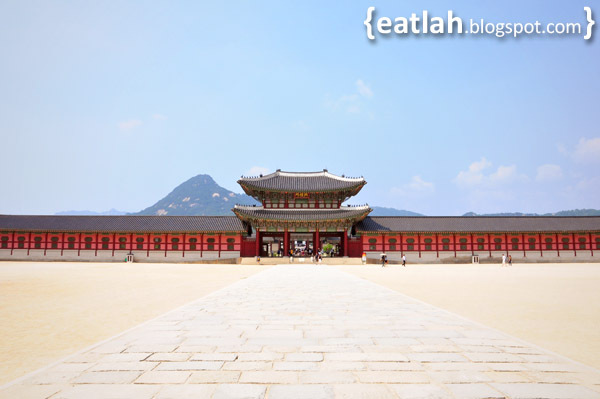 It is the main and largest palace of the "Five Grand Palaces" built by the Joseon Dynasty. 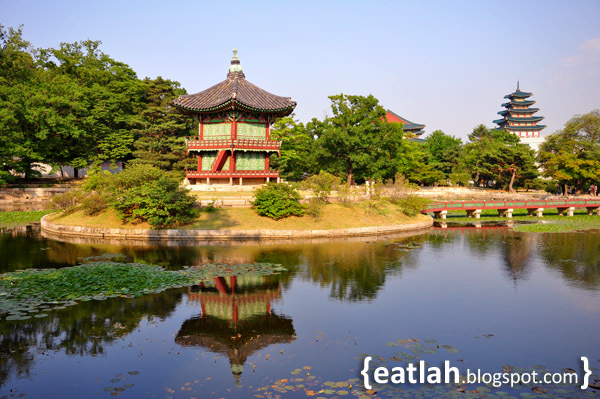 The name of the palace, Gyeongbokgung, translates in English as the "Palace of Shining Happiness." Gyeongbokgung is easily accessible by Subway Line #3 - Gyeongbokgung Station (Exit #5) and Subway Line #5 - Ganghwamun Station (400m walk from Exit #2). The admission fee for adults (age 19 - 64) is KRW 3,000 (RM 8.55), youths (age 7 - 18) is KRW 1,500 (RM 4.28) and age 6 or below is free of charge. Gyeongbokgung operates from 9:00am - 6:00pm (March - October) / 9:00am - 5:00pm (November - February) and is closed every Tuesday. 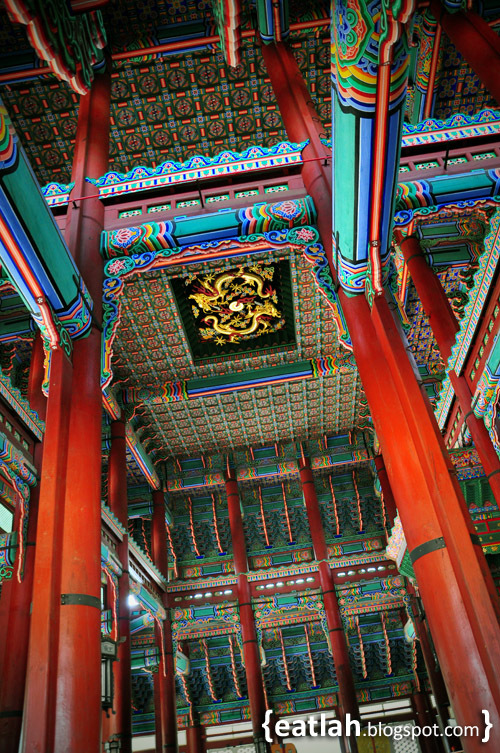 Gyeongbokgung was originally constructed in 1394 by King Taejo, the first king and the founder of the Joseon Dynasty. The majority of the palace was razed to the ground during the Japanese invasions of Korea (1592–1598) and the palace site was left in ruins for the next three centuries. 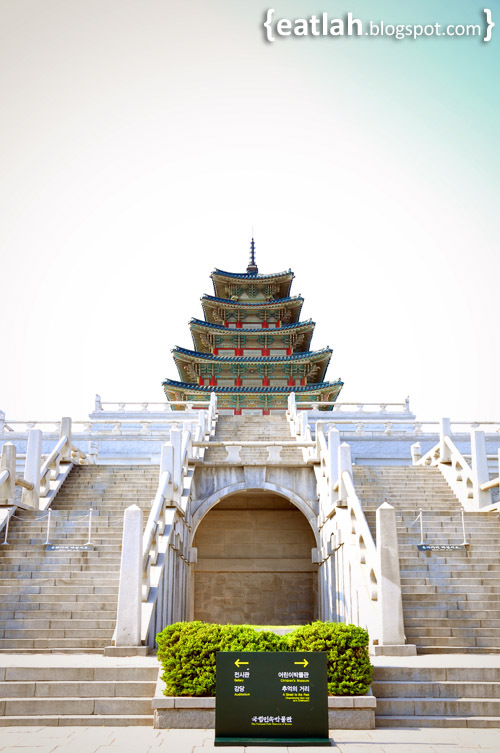 Only in 1867, the palace buildings were reconstructed and Gyeongbokgung again became an iconic symbol for the Korean nation and the Korean royal family. Once again in 1911 during the Japanese occupation of Korea, the Japanese government systematically destroyed most of the buildings within Gyeongbokgung and only few survived. 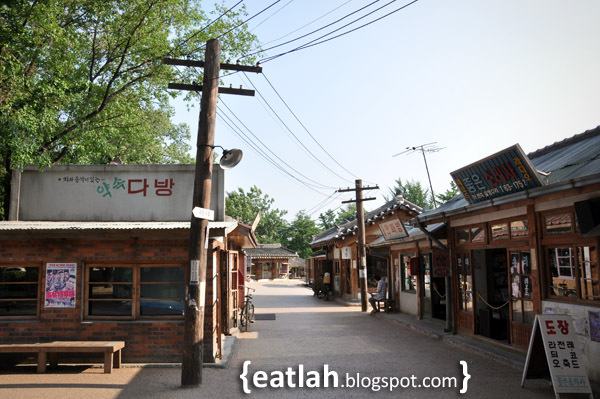 Only from 1989, the South Korean government started a 40-years initiative to rebuild the structures that were destroyed. 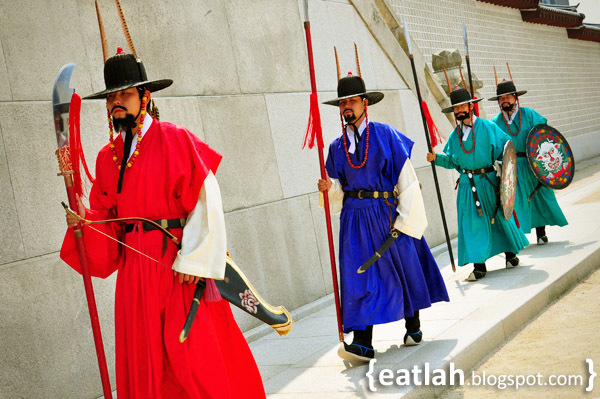 One of the highlight of Gyeongbokgung had to be the change of the guards ceremony every hourly from 10am - 4pm in front of the Gwanghwamun Gate (광화문, the Main and South Gate of Gyeongbokgung) and Heungnyemun Gate (흥례문, the Second Inner Gate). This ceremony first took place in 1469 and it is re-enacted with the guards dressed in bright traditional uniforms of red, yellow and blue, complete with weapons; and they "change" to the sound of drums. 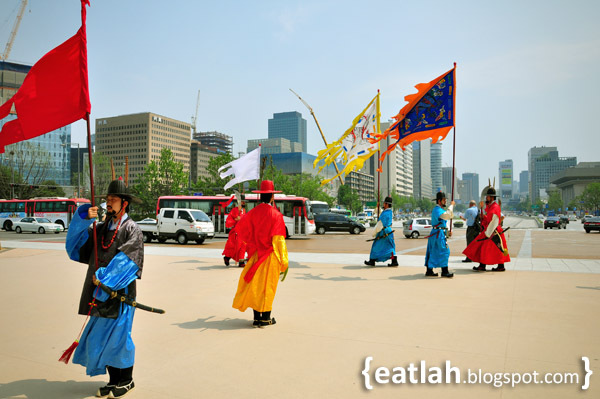 The royal guards marching out from the Gwanghwamun gate with their colorful flags. You can get up close with the guards for photo taking but we're not too sure about touching them. We wouldn't dare to. Especially standing next to them as they loomed over you with a weapon in their hand, it was best not to mess with them. Free guided tours by Korean lady dressed in their traditional hanbok is available in front of the Information Office inside Heungnyemun Gate (the Second Inner Gate). 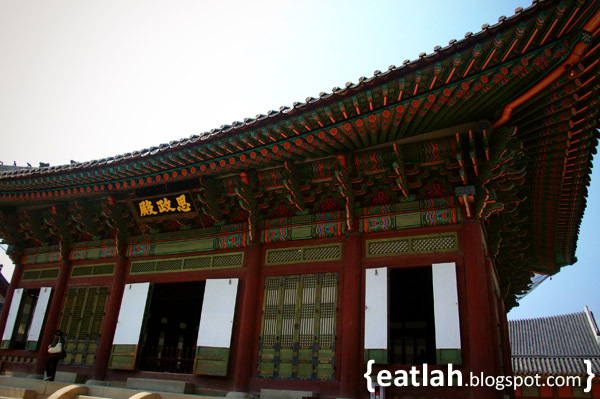 After entering Geunjeongmun (근정문, the Third Inner Gate), we arrived at Geunjeongjeon (근정전, the Throne Hall). Geunjeongjeon, is the throne hall where the king formally granted audiences to his officials, gave declarations of national importance, and greeted foreign envoys and ambassadors. 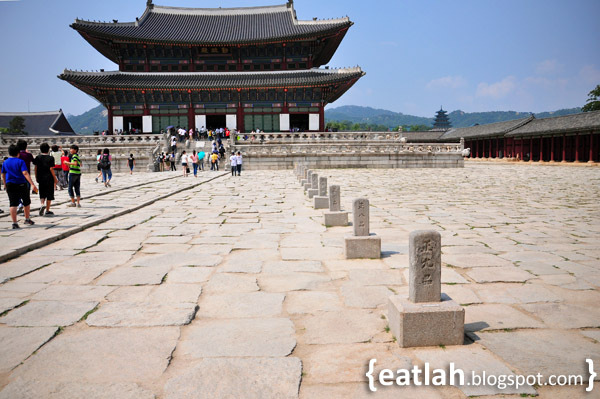 Inside the compound, there are these small stone pillars leading up towards Geunjeongjeon with numbers engraved on them. They are known as the "rank stones". When official events were held, the civil officials would line up according to rank behind the relevant stone. On the ceiling above the Throne Hall, a lifelike dragon painting emphasizes the King's nobility. We had a nice quiet walk within the inner chambers exploring every nook and cranny. Getting off this area, you have two directions to choose from. To the left from the Throne Hall, you have the Gyeonghoeru Pavilion (경회루, Royal Banquet Hall) sitting on an island of man-made lake. Sadly, we missed this out as we happily turned right to the museum pagoda. The skyscraping pagoda resting atop the National Folk Museum of Korea can be seen from afar. Don't think we can visit the pagoda at all, it's probably just for display purposes. 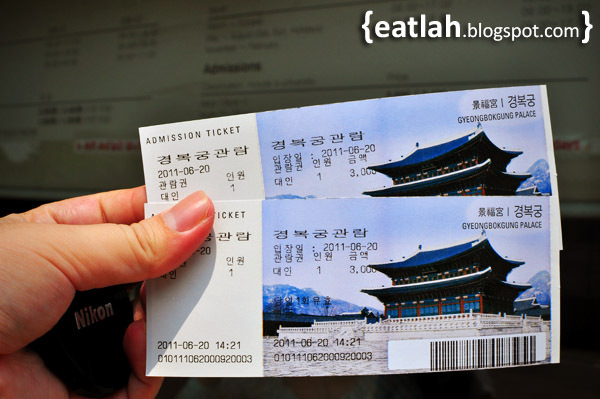 Tickets for Gyeongbokgung are also valid for the National Folk Museum and the National Palace Museum (located near the main entrance of Gwanghwamun Gate). 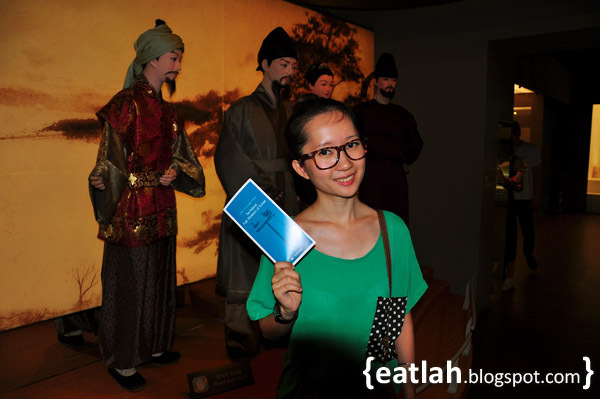 We couldn't visit the National Palace Museum as it was closed every Monday. 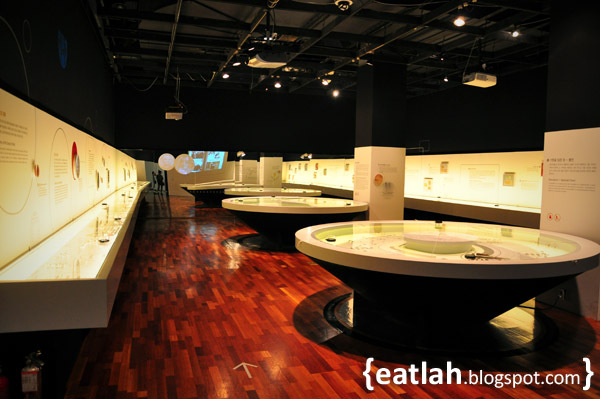 The National Folk Museum presents historical artifacts that were used in the daily lives of ordinary Korean people. 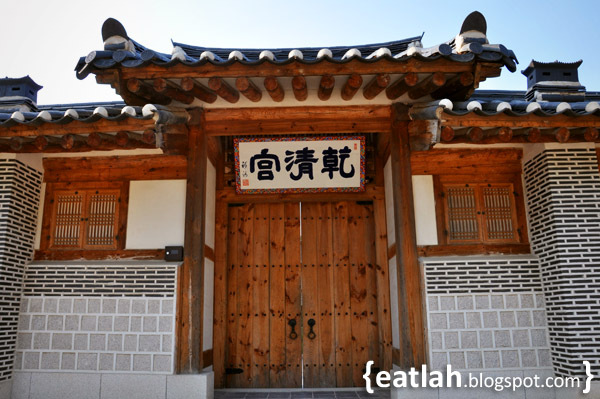 Here you can fully immerse yourselves in the past domestic and agricultural lifestyles, and learn about Korea's cultural beliefs. It might get a little boring after awhile especially if you're not the type who appreciates history. 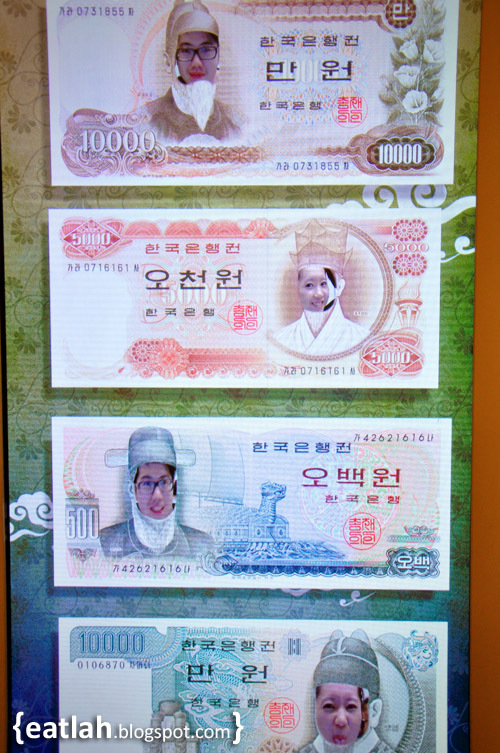 How we wished to have a money printing factory and used these money with our faces on it! 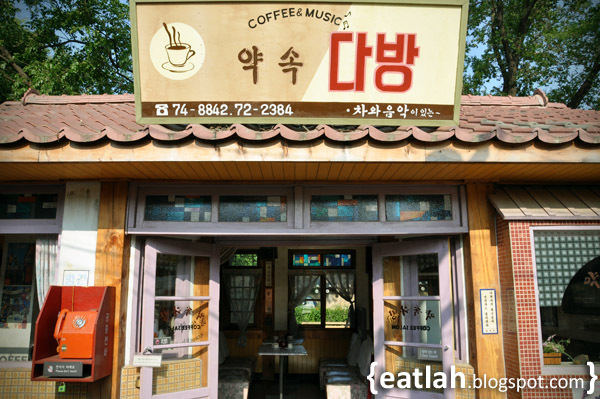 A mini street located next to the pagoda museum is a recreation of vintage 70s Korean village complete with vintage boutique, coffee house, vintage music records store and comic book shop. Then, we walked back out of the museum grounds into the main part of Gyeongbokgung heading towards the Hyangwonji Lake (향원지). 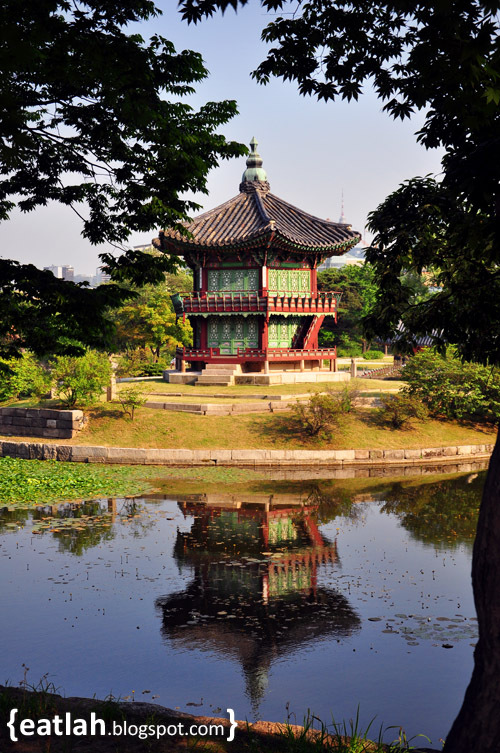 Hyangwonjeong Pavilion (향원정, "Pavilion of Far-Reaching Fragrance"), is a small two-story hexagonal pavilion constructed on an artificial island of a lake named Hyangwonji and a bridge named Chwihyanggyo (취향교, "Bridge Intoxicated with Fragrance") connects it to the palace grounds. 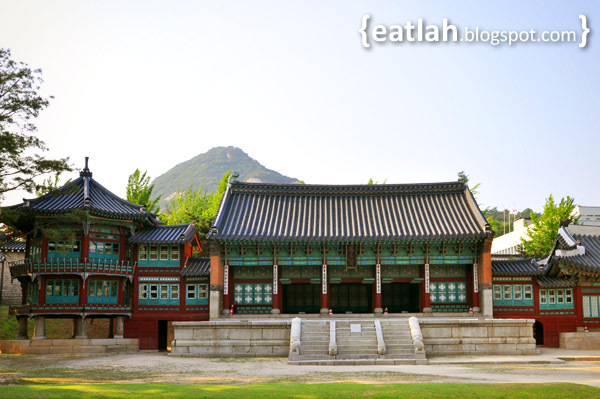 Right up north to the lake is the private royal residence built by King Gojong known as Geoncheonggung (건청궁). In 1895, Empress Myeongseong, the wife of King Gojong, was brutally assassinated by the Japanese agents at Geoncheonggung. Her body was raped, cut, burned and buried near the residence. Haunted by the experiences of the incident, King Gojong left the palace and since then, the royal family never returned to Gyeongbokgung. 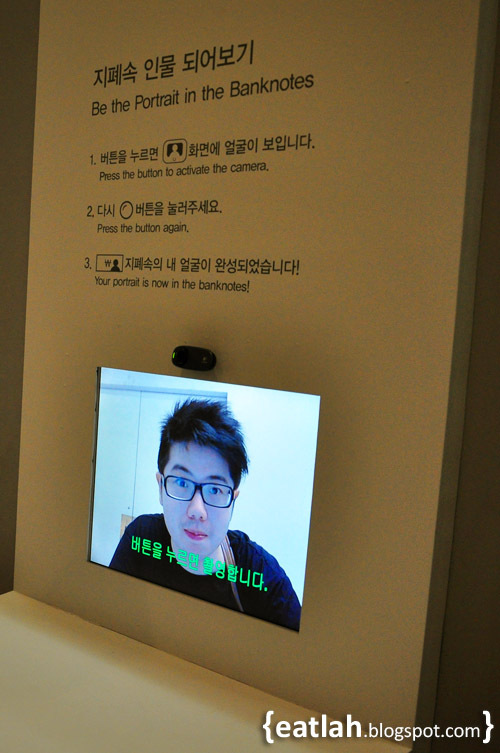 The next stop was Jibokjae (집옥재, "Hall of Collecting Jade"). 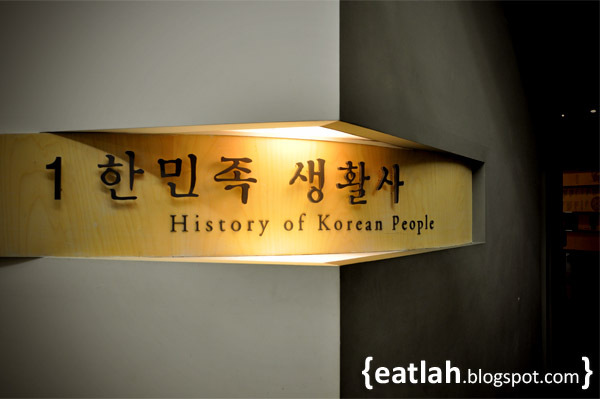 Located next to Geoncheonggung Residence, Jibokjae is a two-story private library used by King Gojong. Jibokjae is flanked by Parujeong (팔우정) to the left, an octagonal two-story pavilion that was constructed to store books. 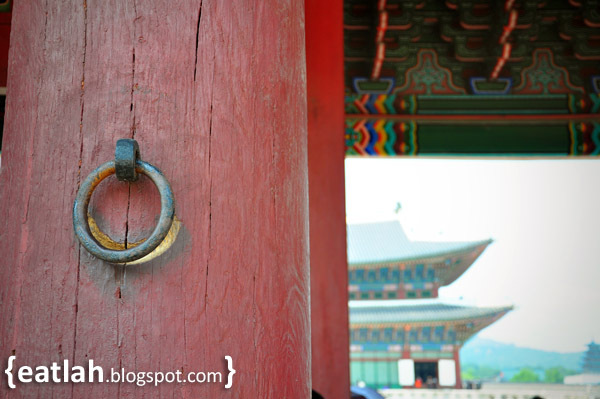 Reaching the end of our Gyeongbokgung journey, we arrived to the North Gate known as Sinmumun (신무문). Going through Sinmumun, we caught a glimpse of Cheongwadae (청와대) or also known as "The Blue House" with Mount Bukhansan (북한산) in the backdrop. 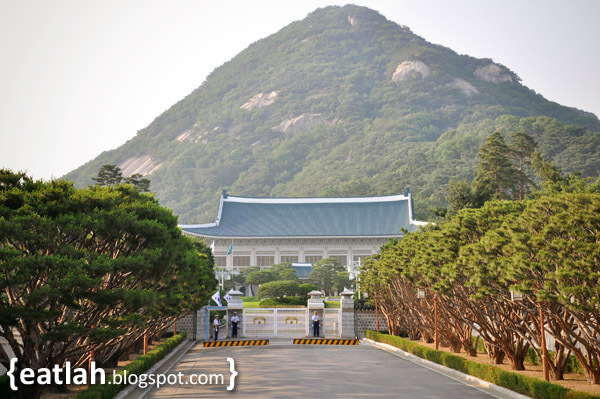 Cheongwadae is the executive office and official residence of the President of the Republic of Korea. To say that we were disappointed would have been an understatement, so don't put your expectations too high. 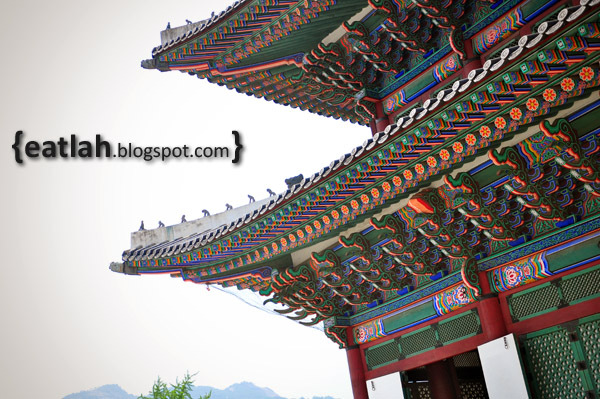 Gyeongbokgung is very reminiscent of "The Forbidden City" in China, although on a much smaller scale and less grandeur. 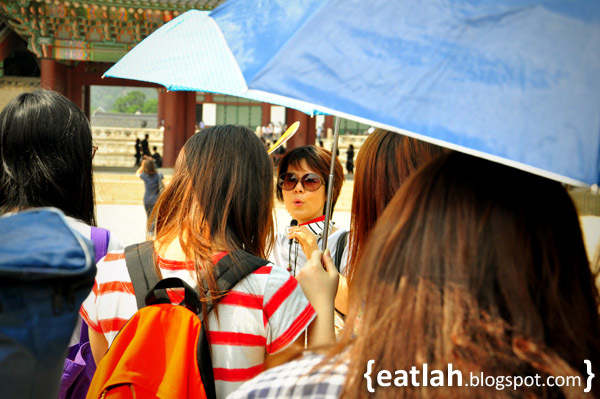 Still, this is the royal palace and it's definitely a must-visit in Seoul! It's best to go early with the free one-hour tour guide because knowledge of the historical background will make the trip a lot more interesting than wandering off by yourself. We arrived late and missed out some. 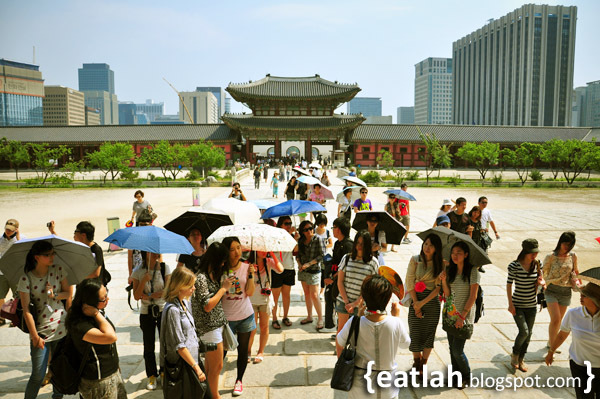 Hence, we weren't able to truly appreciate Gyeongbokgung's bygone era. 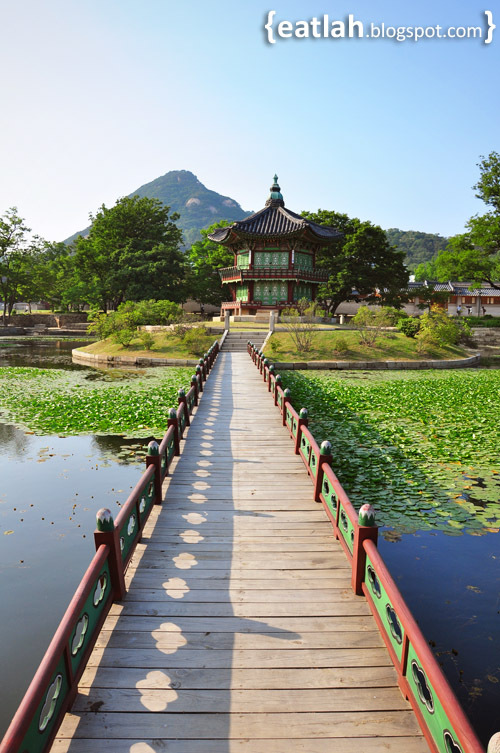 Only after researching and blogging about Gyeongbokgung, we've learnt so much and impressed with the efforts to protect the ground, culture and history of it! 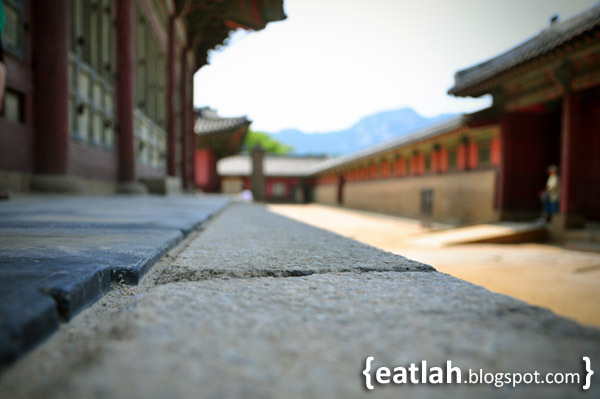 We hope to catch a different perspective Gyeongbokgung in the near future maybe during the fall season. Nice post. I was checking continuously this blog and I'm impressed! Extremely useful info particularly the last part :) I care for such info much. I was seeking this certain info for a very long time. Thank you and good luck. I'm impressed, I have to admit. Rarely do I come across a blog that's both educative and entertaining, and without a doubt, you have hit the nail on the head. yet effective. A lot of times it's tough to get that "perfect balance" between superb usability and visual appearance. I must say you've done a fantastic job with this. and women think. Also, thanks for allowing for me to comment! Good day! I just wish to give a huge thumbs up for the great info you’ve here on this post. here on this post. I shall be coming again to your weblog for more soon. could have here on this post. I will probably be coming back to your weblog for more soon. I wouldn't mind creating a post or elaborating on a lot of the subjects you write about here. Again, awesome site! info you’ve got right here on this post. the great data you’ve gotten right here on this post. Cool, visit also tourist attractions on this website!